So today was the first day I've 'washed' my hair since February 21st. Yes, that's right. 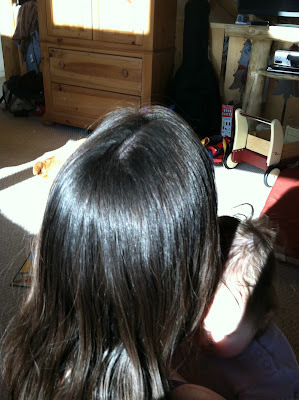 It has been over three weeks since a chemically-laden product has touched my hair. Why? You may be asking. Well, let me tell you. It all started with a conversation with my friend Brooke about how shampoo as we know it is not the best for your locks (strips your natural hair so you have to replace it with conditioner, plus other reasons) and the benefits and downfalls of more natural methods like no-poo or shampoo bars. Now I had tried going no-poo before with not so pleasant effects (straw-like greasy hair), but since then have done more research and wasn't washing my hair everyday (hey-it's Alaska! ), so I thought I'd give it another go. Now you may be asking, 'what is this no-poo nonsense?' Let me explain. For the last 3+ weeks I've been 'washing' my hair with 1 tablespoon of baking soda dissolved in 8 oz of water and ending the shower by rinsing my hair in a 1:5 ratio of apple cider vinegar and water (the soda cleanses and the vinegar softens). Now, while I wasn't completely thrilled with my hair, which was very tangly-though if I had sent more time tweaking, I could have been happy with my hair, but...I'm lazy and it didn't bother me too much- I was thrilled with my skin improvement. Before no-poo my hair was falling out by the handfuls and my freaky skin disease (aka eczema) was showing it's ugly head in scabs on my scalp. Not very fun. Since no-poo, my hair is staying on my head more and my eczema has cleared up on my head. Amazing! But the whole hair thing was kind of starting to drive be batty, so I started researching the shampoo bar previously mentioned by Brooke. What I found completely revolutionized my soap world. Let me show you! Just think...you could make your own, too! Now I always pictured making soap as an arduous and dangerous endeavor that took months to have a product you can use (I'm more of a immediate gratification kind of gal when it comes to projects). 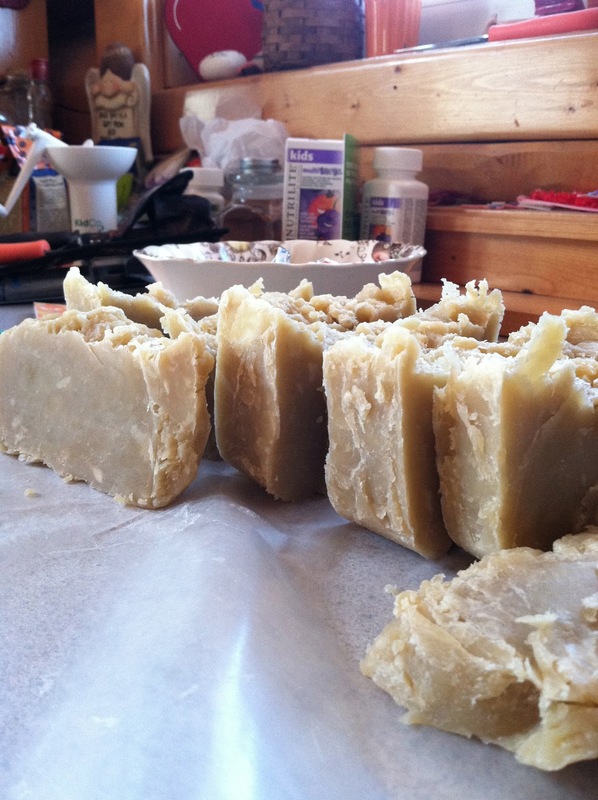 But, my conception of soapmaking experienced a drastic paradigm shift by one simple blog post found at Frugally Sustainable. 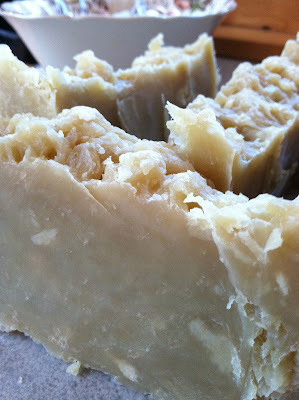 A blog post about homemade shampoo bars made in your crockpot! When I read how simple it was and that I had all but two of the ingredients, I knew I had to try it. It was seriously one of the easiest projects I've ever done! on my body limiting the amount of junk in the tub. So, not the best pic, but with sick kids, you have to take what you get! Now I can't wait to make different types of soap! I'm thinking I may have a new obsession!